Chrichton's World: The Boy (2016): A good premise ruined. Big con job! 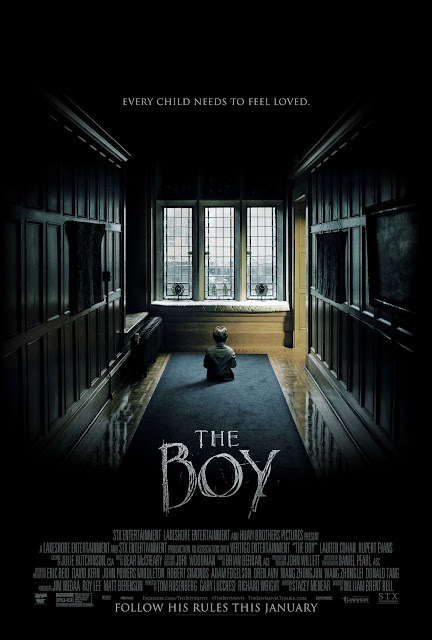 The Boy (2016): A good premise ruined. Big con job! Oh boy, here I thought I was in for a decent creepy doll flick. Sadly this film misses it mark completely. The Boy does start well with a nice creepy setting and atmosphere. The house and the old parents living in it are very weird for sure. Lauren Cohan as Greta appropriately shows disbelief of having to babysit a doll that does look like a real boy. Do think she should not have laughed but it´s understandable. Anyway the mood is set and it´s a matter of time before things starting to get weirder and creepier. Right? Wrong! Somehow even with the right atmosphere, right setting and creepy doll there is a huge lack of tension and suspense. And this is mostly because of Cohan´s inadequate acting. It´s not that she is bad. But it´s more like she does not know how to act and respond to the strange things happening around her. I could never tell if she ever was truly scared. She is also supposed to play a traumatized woman and not once does this become apparent in the way she behaves. But since it is an important detail we are told by her. Honestly I would never have guessed something was wrong with her psychologically. She was far too cheerful for my taste. Only in the phone conversations she had with her sister we sort of got an idea why she was willing to babysit a doll. The doll is the main attraction and it is damn creepy alright. But the doll does very little. The few times he does something isn´t nearly as unnerving or scary as it should have been. And when it´s time for the doll to show his true colors you will find out what really is going and it could not be more disappointing. It is then I realized I have been conned and that the film was ruined beyond redemption. The twist is so silly that it completely destroys the original premise. (This coming from a guy who loves ridiculous twists in the cheesiest B movies and giallo´s). The biggest problem is that no satisfying hint is given that would make sense of it. It becomes clear that whatever story they had was incredibly thin and the imagination of the director even thinner. Nothing fresh or original is done. They could have remedied this with giving us a good and compelling background story to make it worth your while. Unfortunately none of that. Even the ending is predictable to a tee. Why? I guess this is what you get when a inexperienced director is involved. I don´t care about his previous film Wer that supposedly is good. If you ruin a good premise like this you don´t deserve any respect. Also this director needs to learn that people like to run their imagination wild. Give them just enough to look at things from different angles where you never can be sure what is going on until you have no choice but to reveal. Make the viewers doubt themselves. Even bad twists need to be build up. I was looking forward to this as I can´t get enough of creepy doll flicks. But my advice is stay clear from this one and go watch one of the following movies underneath this review. They are superior to The Boy.